The Seattle General Strike lives in popular memory as a testament to the power of solidarity and direct action by working people. Diverse groups united across occupations and political affiliations to assert themselves in a powerful eruption of action that closed down the city for six days. 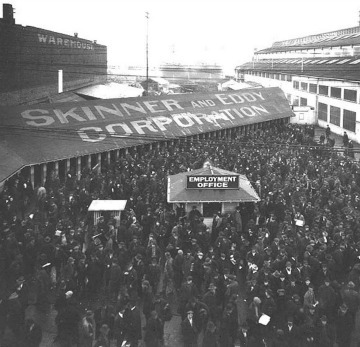 The strike was administered peacefully and competently by the workers themselves and had lasting consequences for the labor movement in Seattle, the United States, and beyond. This exhibit is part of a statewide series of programs and events in 2019 commemorating the Solidarity Centennial.